Today Blueair, a world-leader in air purification solutions, launched Blueair Professional to meet consumer demands for clean air in hotels, restaurants, gyms, offices and other public areas. The Blueair Professional service offering is based on Blueair’s 20 years of experience in developing state-of-the art air purifiers for home and on-the-go-use. 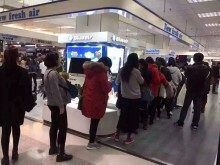 As 2015 came to an end, tens of thousands of China's half-a-billion middle-class consumers braved smoggy conditions in key cities like Shanghai and Beijing to join long shopping mall queues in the hope of being able to buy an indoor air purifier.